•Cooling : Natural Air / Oil.
. • More than 95% efficiency. We are learned team of engineers and technicians engaged in offering Industrial Stabilizers that finds it application in varied industries like steel, cement, mining etc. 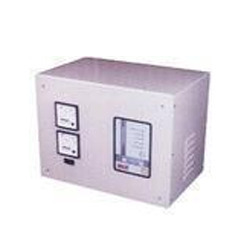 This is specifically used to supply continuous output and input voltage in situations of fluctuating power supply. This is a highly reliable and performance oriented stabilizers that are created with use of industry standard components. This can be availed at a leading market rates after a thorough check by our qualified technicians to certify compliance. 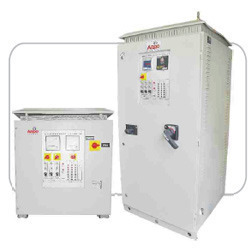 Keeping in mind the varied requirement of our customers we are engaged in offering Servo Control Voltage Stabilizer that finds its applications in textile machinery, telecom equipments, office equipments and industrial control systems. Use of industry standard components confirms high performance, temperature resistance and great power capacity. Additionally, this avoids any malfunctions or any fluctuations of the electronic equipments. These are tried and tested by our learned technician before it is made for customers use to certify compliance. Delivery Time: Within 2 to 3 weeks from the date of receipt of your firm order. 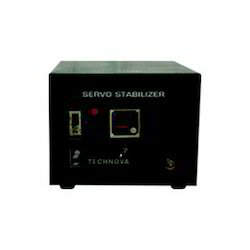 We are one of the acknowledged organizations in the market of a complete assortment of Electrical Servo Stabilizer to our respected customers. These products are fabricated and developed using top notch quality basic material which is sourced from authentic vendor of the market. Along with this, these products are obtainable in various models and specifications as per the requirements of our clients. Ambient Temperature 40 to 55 C.
Both electrical and electronics appliances occupy a prime place of importance in our lifestyle and thus usage of electricity in modern life has substantially increased. But, voltage supply, on the hand , receives very little attention from the consumers. Surprisingly, unstable voltage supply has the potential of causing havoc due to lack of foresight on our part. Even you must have observed the heavy variations in voltage supply during day or night, which results in frequent breakdown, Low production and loss of energy. 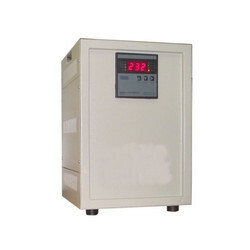 Thus you need to consider good quality servo controlled voltage stabilizers with various important factors taken into account. This will not only ensure safety but an effective reduction in electricity bills and an increased life span for your sophisticated equipment''s. 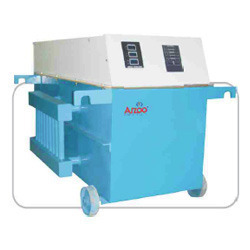 We, Arzoo, are manufacturing servo controlled voltage stabilizers ranging from 1 KVA-1500KVA [conforming to IS:9815] available in multiple configurations, that undergoes through a series of quality tests conducted in our laboratory. In the field of power saving, we expertise for more then Eighteen years, providing total power solutions, prompt and reliable after sales service / support to our customers through an experienced team of service engineers. 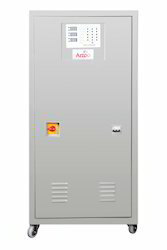 The ARZOO range of Servo Control (Voltage Stabilizers) are universally recognized as the finest range of servo-controlled voltage stabilizers. The units couple exceptional performance with unequalled build quality to provide an unmatched combination of reliability and versatility. The units are designed to correct power quality problems like brownouts, surges, over-voltage, sags, voltage imbalance, unbalanced current, line noise etc. in the main power supply. 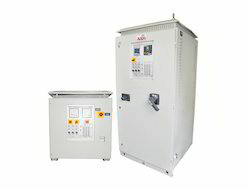 Our Servo Control features voltage regulation, isolation, filtering, harmonic cancellation, transient suppression, surge protection, or any combination of these in a one-box solution. 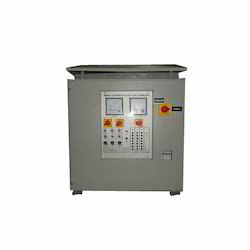 Besides that, our patent voltage regulating transformer enabling us to make unique small dimension Servo Control especially for individual regulation. • Cooling : Natural Air / Oil. • More than 95% efficiency. 1. Input Voltage Range 295 Volts to 470 Volts 3 Phase 50Hz. AC. Supply. 2. Output Voltage 415Volts + 1% 50Hz. 3 Phase .AC. Supply. 3. 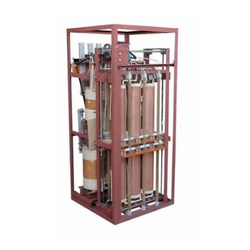 Type of Machine 3 Phase Unbalanced Units. 6. Speed of Correction 60V/second. 8. Nature of cooling Air cooled. 9. Type of Duty Continuous. 10. Metering DC. Digital Voltmeter to measure input and Output voltage for each individual phases. 12. Protection UV/OV, Output Over Load, with tripping with the help of electronic circuit. 10. Metering DC.Digital Voltmeter to measure input and Output voltage for each individual phases. 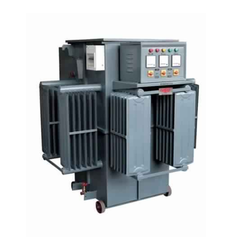 We are providing 15 KVA TO 500 KVA Auto Servo Controlled Voltage Stabilizer . 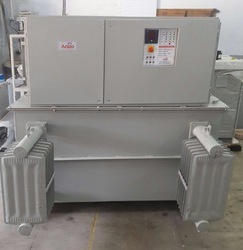 We are providing15KVA TO 450KVA Auto Servo Controlled Voltage Stabilizer . 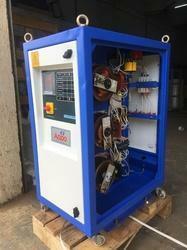 We are providing15KVA TO 300KVA Auto Servo Controlled Voltage Stabilizer . 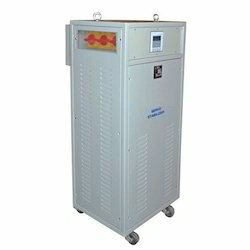 We are providing 3KVA DC TO 10KVA Auto Servo Controlled Voltage Stabilizer. 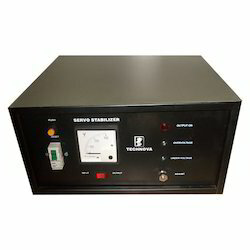 We are providing 12KVA TO 300KVA Auto Servo Controlled Voltage Stabilizer. 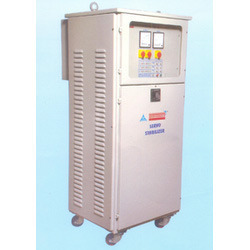 We are providing 12KVA TO 250KVA Auto Servo Controlled Voltage Stabilizer. We are the leading supplier of 25KVA Servo Controlled Voltage Stabilizer made available to our clients at competitive prices. 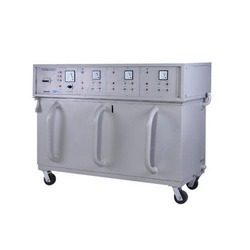 We are providing 25KVA Servo Controlled Voltage Stabilizer. We are the leading supplier of 12KVA TO 300KVA Servo Controlled Voltage Stabilizer made available to our clients at competitive prices. 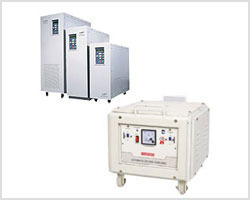 We are providing 12KVA TO 300KVA Servo Controlled Voltage Stabilizer. We are the leading supplier of 20KVA Servo Controlled Voltage Stabilizer made available to our clients at competitive prices. 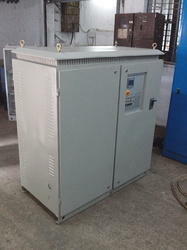 We are providing 20KVA Servo Controlled Voltage Stabilizer. We are the leading supplier of 30KVA Servo Controlled Voltage Stabilizer made available to our clients at competitive prices. 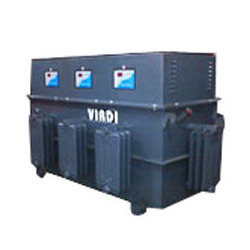 We are providing 30KVA Servo Controlled Voltage Stabilizer. We are the leading supplier of 15KVA Servo Controlled Voltage Stabilizer made available to our clients at competitive prices. 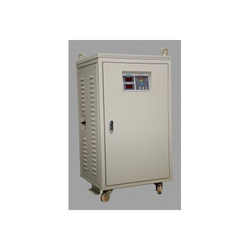 We are providing 15KVA Servo Controlled Voltage Stabilizer. We are acclaimed names in the market, highly involved in offering an extensive array of Heavy Duty Stabilizer to our respected customers. Our offered stabilizers are acknowledged in different industries for varied purposes. These stabilizers are manufactured using best grade raw material which is sourced from the authentic and reliable vendor of the market. 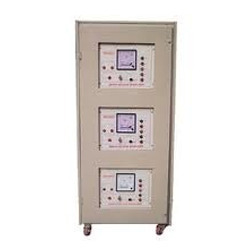 We are engaged in offering a comprehensive range of Three Phase Voltage Stabilizer that is manufactured using excellent quality raw material and modern technology. Our offered products are checked against various parameters under the vigilance of our quality controllers to deliver a flawless range at the client's end. Delivery Time: Within 1 to 2 weeks from the date of receipt of your firm order. 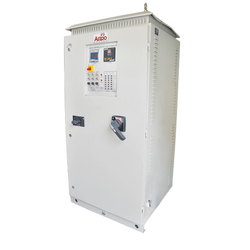 The ARZOO range of Servo Control Voltage Stabilizer are universally recognized as the finest range of servo-controlled voltage stabilizers. The units couple exceptional performance with unequalled build quality to provide an unmatched combination of reliability and versatility. The units are designed to correct power quality problems like brownouts, surges, over-voltage, sags, voltage imbalance, unbalanced current, line noise etc. in the main power supply. 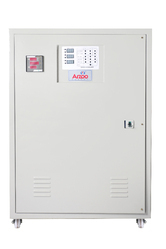 Our Servo Control features voltage regulation, isolation, filtering, harmonic cancellation, transient suppression, surge protection, or any combination of these in a one-box solution. 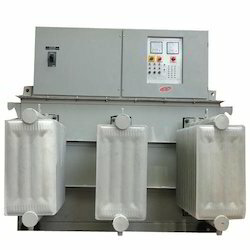 Besides that, our patent voltage regulating transformer enabling us to make unique small dimension Servo Control especially for individual regulation. • Available from -1 KVA to 1500 Kva. • Correction Rate better than 60 V/sec. • Cooling : Natural Air/Oil. • Ambient Temperature 0 to 500 C.
• Built in EMI/RFI Filter. 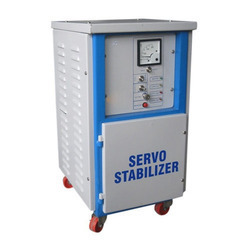 We are one of well known suppliers of Servo Voltage Stabilizer in the market.we are involved in manufacturing, supplying and exporting a wide range of Servo Voltage Stabilizer to our esteemed clients. Delivery Time: Within 3 to 4 weeks from the date of receipt of your firm order. Our ability in the arena of Stabilizers has engaged in offering Power stabilizers that are created with use of industry standard components and under the supervision of our highly learned technicians. This is an ideal choice for protecting sensitive and high capacity electronic appliances against any kind of fluctuations in voltage in supply. These are available for customization to match the customer’s application requirements. Additionally all our products are tested before it is made for customer use to ensure compliance. Our hard work in customer satisfaction has always positively paid us and thus we continue to do so with offering a range of Thermal Stabilizers that are highly efficient and cost effective. With a primary application in ensuring continuous supply of power in electrical or electronic equipment this is created with at most precision and care. Our team of learned engineers constantly are involved in research and development in the offered field to ensure the best is catered to our customers. 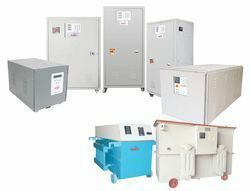 Backed with immense industry-experience and knowledge, we are engaged in offering a comprehensive range of Single Phase Voltage Stabilizer that is manufactured using excellent quality raw material and modern technology. These products are used in various electrical and electronic applications in various industrial sectors. Moreover, our offered products are checked against various parameters under the vigilance of our quality controllers to deliver a flawless range at the client's end.